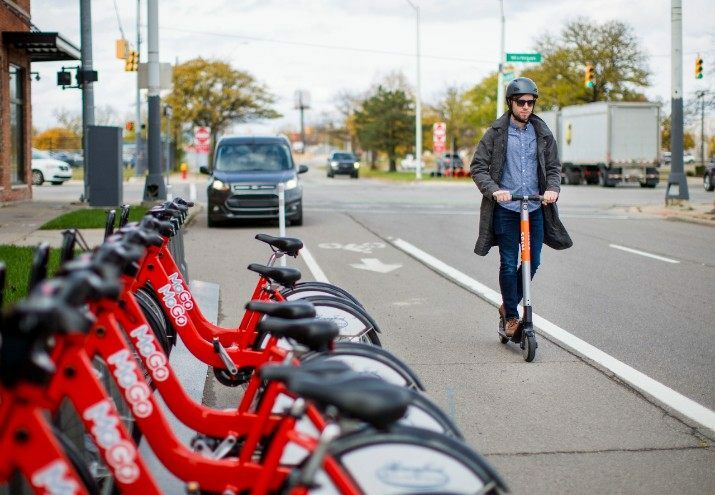 The formation of a new advocacy group and the publication of a new “playbook” by a separate organization are seeking to increase the focus on developing more shared “micro-mobility” services such as ride-hailing, dockless bikes, electric scooters, and other transportation options now being rapidly deployed in cities across the country. The New Urban Mobility alliance or NUMO is a new advocacy group launched by the World Resources Institute’s Ross Center on Jan. 15 and funded with a $6 million seed grant from businessman Stephen Ross. The group’s aim is to become a “big tent alliance” committed to incorporating more ride-hailing, dockless bikes and scooters, and even autonomous vehicles into U.S. urban communities, noted Robin Chase, Zipcar co-founder and executive chair of the NUMO steering committee, in a statement. Robin Chase. Photo by Swanny Mouton. “The pace of innovation and disruption on city streets is forcing everyone – residents, city staff, regulators, and the private sector – to rethink long-held assumptions. It presents us with the opportunity to correct current problems and remake cities for the 21st century,” she said. Harriet Tregoning – a former executive with the Department of Housing and Urban Development during the Obama administration and former director of the District of Columbia Office of Planning – will lead NUMO as its director and said that targeted research, pilot projects, and public engagement campaigns will hopefully “catalyze faster answers” to a variety of urban transportation issues. Meanwhile, the Transportation for America advocacy group published a new “playbook” to help cities manage what it calls the “explosive growth” in micro-mobility services. “The rapid emergence of these new micro-mobility services has created new clean and convenient options for people to get around, and they certainly offer a wealth of potential benefits. But there’s still so much to learn,” said Russ Brooks, T4America’s director of smart cities, in a statement. “They can help advance city goals related to equity, access to jobs and services, climate, and more. But in order to achieve these goals, cities have a major role to play in thoughtfully managing them to ensure that the benefits accrue equitably to everyone,” he added. “This incredibly rapid pace of change is unlikely to slow anytime soon, and it highlights the need to create flexible regulatory frameworks that will help cities integrate new technologies and contribute toward their preferred long-term outcomes,” Brooks noted.